Home Bonny Boys (Dressy Separates) Boys Button Down Dress Shirts Exclusive Vintage Look Golfer Knicker Set One size 8 Left! Exclusive Vintage Look Golfer Knicker Set One size 8 Left! This is an exclusive put-together look from DapperLads. 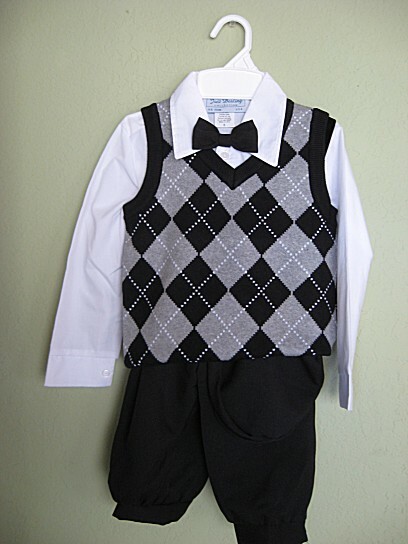 This 6 - piece set includes a white cotton poly shirt, a 100% cotton sweater vest, black knicker pants with velvet ribbon suspenders, black hat and bow tie. The cotton argyle knee socks below (sold separately) coordinate perfectly. Such a great look for the golf course or for plays and pictures. Ships in 1 - 2 business days.